The folks at Livet Hemma are enticing us this week with another backyard space to inspire. Clear out the shed, leave the car outside or maybe even empty the greenhouse this summer and make a backyard oasis; a place for a coffee party, afternoon nap or maybe a full day with a few pocketbooks. Below are a few images from some previous spaces I've posted here on the blog with the same sentiment. 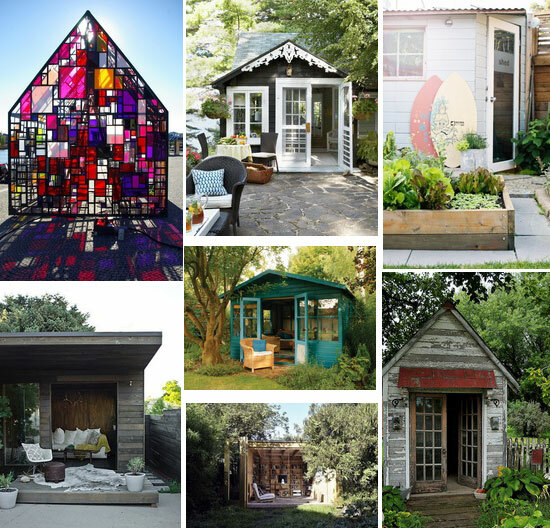 You can find them along with a heap more backyard inspiration spaces on my Pinterest boards here and here. Great...another Pinterest thing for me to obsess on..(wink) thanks! First photo- What a perfect little getaway. Ah, yes a backyard oasis sounds pure fantasy right now, since I'm apartment living. I love the stain-glass shack----maybe tooooo fancy to call a shack. Going to check your pinterest now.